MOSCOW (Sputnik) - North Korea is suspected to have started the removal of test stands for its intercontinental ballistic missile (ICBM) program, based on analysis of new satellite images of the missile test sites, according to a website affiliated with a US think tank. 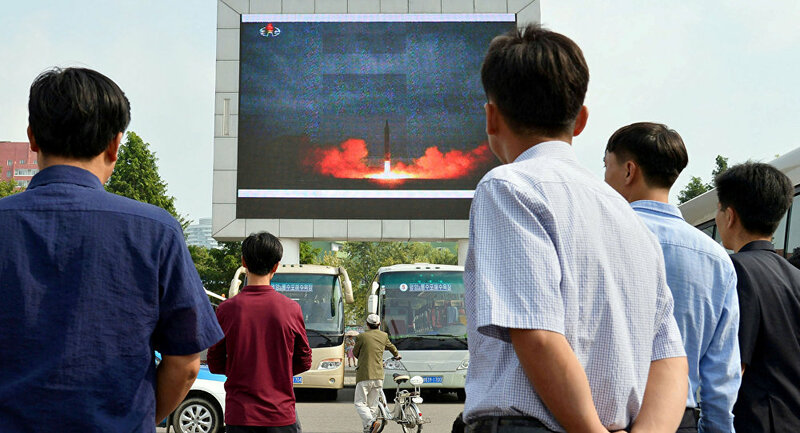 "New commercial satellite imagery indicates that North Korea is razing the missile test stand at the Iha-ri Driver Training and Test Facility north of the city of Kusong in the wake of Kim Jong Un’s April statement announcing a unilateral suspension of ballistic missile and nuclear tests," the 38 North website under the Washington-based Stimson Center said in a report published on Wednesday. According to the analysis compiled by Joseph S. Bermudez, an internationally recognized analyst on North Korea’s defense and intelligence affairs, satellite images published on May 19 showed that structures at both of the test sites had been removed and most of the support infrastructure had been razed. The report added that the demolished facilities may not be an indicator that North Korea had started to suspend its missile programs. "It is unclear whether the destruction of the stand is an indication that the North is suspending this portion of its missile program or that Pyongyang plans to erect other similar facilities in the future," the report said. As the highly anticipated June 12 summit between US President Donald Trump and North Korean leader Kim Jong-un approaches, Pyongyang has been attempting to demonstrate its commitment to diplomatic efforts in resolving the nuclear crisis on the Korean Peninsula by dismantling its only known nuclear test site last month.